I wrote a while back about coaching cue myths with the squat. After attending a seminar at the NSCA Personal Trainer's Conference in Las Vegas given by Brad Schoenfeld and his talk and the packed lecture room reminded me that people still are fighting against bad information regarding the mechanics of "The King of All Exercises." Over 200 muscles are activated through squatting. 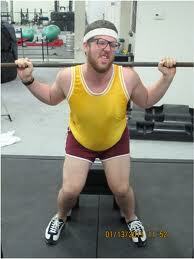 So if you're looking for strength and size and a great hormonal punch in the crotch, the squat is where it's at. 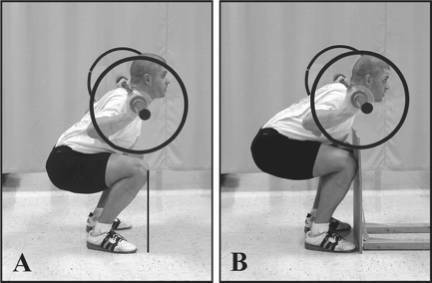 First, let's address the most common misconception that I still hear echoed around: squatting is bad for your knees. Yes, if you squat like a spaz. But if you squat properly (neutral spine, weight in heels, knees out), you'll actually be doing your knees a lot of good by going fairly deep. First, let's address the ACL. The ACL takes up to about 85% of the shear forces during the first 60 degrees of knee flexion. Let's say you stop there and are content doing quarter squats, you'll be moving though a range with load that is predominantly putting stress on your ACL and shearing forces across the knee. As you get deeper, the hamstrings kick in more and take the load off the ACL. Additionally, as the angle of knee flexion increases, the forces across the knee become less shearing and more compressive, which is actually easier on the structures of the knee, thanks to the mechanics created by our patellas. Great, so that's out of the way. Now let's talk about thee knees going over the toes and how that's "not supposed to happen." When the knee gets blocked, the athlete has to lean way over to keep the center of gravity over his feet. I think most people can reasonable understand that the more up right the spine is, the greater tolerance it has for load bearing. As the bar gets heavier, the center of gravity will get closer to the bar and necessitate a more upright position, which means knees even further forward. 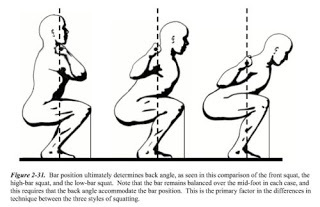 Thanks for listening to my rant, and if you would like to learn more about the science and anatomy of the squat, you can follow Brad Schoenfeld at his website. Thanks for letting me rant!